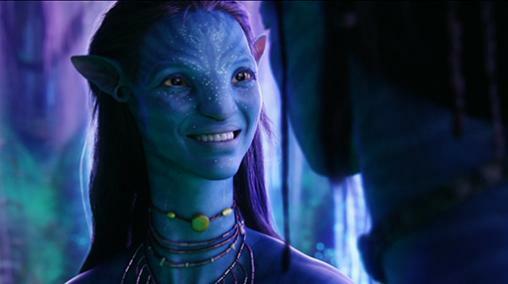 The Na'vi | Pandorapedia: The Official Guide to Pandora | Own AVATAR on Blu-ray & DVD Now! General Description: The Na’vi are humanoid bipeds. They are morphologically similar to humans. Unlike most vertebrates on Pandora, which are hexapedal, the Na’vi have four limbs, and have four digits on feet and hands. In many respects, the Na'vi body is human-like (and, even by human standards, beautiful). The waist is narrow and elongated. The shoulders are very wide, creating a v-shaped upper back. The body overall is more slender than even an ectomorphic human and is characterized by an elongated neck. The musculature is sharply defined, giving no sense of emaciation despite the thin proportions (they have roughly four times the strength of the average human). Their eyes are large and sensitive to wavelengths of light inclusive of the human visual range, and beyond into near-infrared. For balancing their long torso and legs, the Na'vi have a long, prehensile lemur-like tail. They can traverse the landscape on the surface as well as using a form of brachiation from branch to branch similar to Earth primates. Na’vi vary in size, by region and genetic history. Maximum recorded height is 3.9 meters, with a mass of 290 kg, for a Na’vi male. Adult Na’vi males in the region of Australis surrounding Hell’s Gate, average 3 meters in height and 210 kg. Females in this region average 2.8 meters/190 kg. Other examples of gender dimorphism are the pronounced pectoral tendons and sternal prominences in the male. Data on lifespan is incomplete. It is generally accepted to be longer than human by approximately 30%, but the rate of maturation is more rapid followed by a plateau of adulthood without physical decline. Range: All biomes of Pandora. Populations of Na’vi are known to exist in every environment of Pandora, from tropical rainforest and equatorial desert to polar regions, boreal forest, mountains, ocean shorelines, wetlands, and archipelago. The Na’vi show evidence of rapid evolutionary adaptation to widely varied habitats. Some scientists consider some of these adaptations so significant that they represent true speciation, but this is controversial, and there is strong agreement among geneticists that the Na’vi are a single species, though with wide variation morphologically, like domesticated dogs on Earth. Range Various biomes of Pandora. Population concentrated in rainforest regions. Outlying clans have been detected on each continent and in subarctic, swampland and mountainous regions. Anatomy Smooth skin is iridescent, cyan color. Long, prehensile tail. Skull is proportionately small, high cheekbones, feline ears and a protruding, snout. Bioluminescent markings for identification, mood display. Average lifespan is similar to that of a human. Despite skin color, Na'vi have red blood. Feeding Ecology Omnivore. Hunter and gatherer with incipient agriculture, including brewing. Size Average male is three meters tall, females slightly smaller. Notes Generally peaceful, but ferocious in defense of home, clan and family.